A chicken and sausage stew made with skinless chicken legs and spicy andouille sausage simmered with flavors from the deep south – without the extra fat. Today is Fat Tuesday, but any day is really a great day to enjoy this comfort dish. Traditional gumbos are made with a whole lot of fat and take hours to make. My lighter version you won’t miss the fat because there’s still tons of flavor. The stew itself is not very spicy, but the sausage is so you get a little heat each time you take a bite. If you’re not a fan of spice, a smoked turkey sausage or turkey kielbasa would taste great too. To lighten this dish, I use lean skinless chicken on the bone (the bone adds great flavor) and lean chicken/turkey andouille sausage. 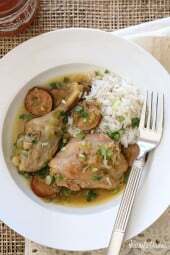 It’s simmered with onions, bell pepper and celery, also known as the “holy trinity” in Cajun cuisine, and topped with scallions. This is the type of dish you may want to serve with a fork AND spoon, I served mine with 1/4 cup of cooked rice on the side, completely optional. Quinoa or farro would also work nicely. I found the chicken a little tricky to calculate on the bone; I was getting discrepancies when I calculated it raw, vs cooked on the bone, vs cooked off the bone so I decided to weigh the meat off the bone cooked, I feel this is the most accurate. The chicken I purchased was from a small bird, so if you have really large chicken, the nutritional info will change. If you prefer white meat, be sure to use skinless breasts on the bone so your meat doesn’t dry out and you still get the great flavors from the bones. Low carb, gluten free, and really good! Heat a large deep non-stick skillet over medium heat. 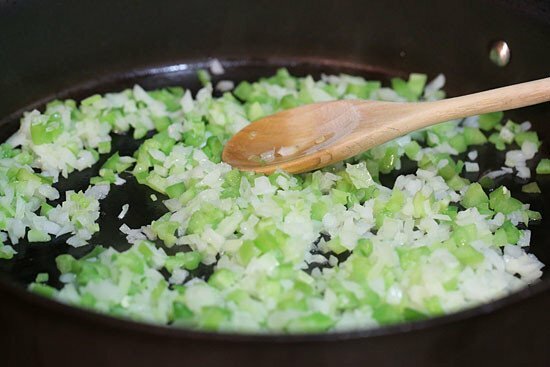 When hot, add the oil, onions, peppers and celery. Cook 3 to 4 minutes, stirring. Push the vegetables to the edges of the skillet and add the chicken, season with salt and pepper. Brown 2 to 3 minutes on each side, then sprinkle the flour over the chicken and vegetables. Add the water, sausage and bay leaf, adjust salt and pepper to taste, then cover and reduce heat to low. Simmer 30 to 35 minutes, remove bay leaf and top with scallions. Serve with rice or quinoa if desired. Is it possible to adapt this to an instant pot meal? Can’t wait to try this recipe! My husband has to watch the cholesterol and sodium in what he eats, any clue to what the cholesterol is with this recipe? Just made this!! So delicious!! I am little confused with the chicken, do you put the raw chicken in the pan, then it cooks as you simmer it? Could this be made with boneless chicken pieces? Would the cooking times need to be adjusted? Any info you could supply would be greatly appreciated. I made this for dinner tonight, and it was fantastic! I absolutely love this site. Thank you so much for sharing all of your recipes with us. It is my "go to" spot for my weekly meal planning! Made this tonight and it was delicious. My grocery store didn't have turkey andouille in stock so I substituted turkey hot Italian sausage, which tasted absolutely fine but didn't look quite as nice as the andouille or kielbasa would have looked. Served it with cilantro-lime rice and it was a big hit. I love you site. I use it all the time. I made this dish tonight and I felt like it was missing flavor. I actually substituted the water for chicken broth. It was to bland for my taste but I still love cooking your recipes. Made this last night and my baby LOVED IT!!! I only had boneless thighs but I still thought it tasted great. Tonight I'm making the Carne Bistec. Everything I have made from this site has been great. Made this one tonight with 6 chicken thighs. Delicious! I cooked this a couple of weeks ago and put a good portion in the freezer. After defrosting, this dish is just as awesome! However, I did have to pull out the chicken and rice for my picky eater who does not do spicy. I love your website. I have turned your website onto so many of my co-workers. Looking forward to making many more of your dishes. Wow, what a delicious dish. Made it for the first time tonight, it was so easy and so delicious! Looking forward to leftovers tomorrow… will definitely make again! This looks amazing!! I was wondering, does it make a difference using leg quarters? I made this for my family tonight and I wished I made more. It was a HUGE hit! My husband literally licked his plate! I can't wait to share this recipe with others and tell them about your site! My sister has sent me so many of your recipes but this was the first time I tried any of them. I will be back for more! Thank you for sharing your talent with us. I look forward to trying more of your recipes! I made this two nights ago and I'm eating the leftovers now. YUM! It turned out great! I used chicken breasts since that is what i had on hand… they were perfect, not dry at all. The andouille sausage really gives is some heat/spice so keep that in mind if you don't want it spicy! Wow, this is yummy. I followed the directions except I used boneless, skinless chicken breasts and then put it all in the slow cooker. I seared them like the directions said and then shredded them to thicken the stew – yummy! I made this for dinner last night… so impressed with myself! Thanks for making all your recipes so easy to replicate =) This one is a keeper. I am making this as I am typing!! My house smells amazing…LOVE your site. Thank you so much!! Question- if I use regular sausage (my 5 year old is very particular about her sausage) but I don't eat the sausage, I'm not a huge sausage fan, will that increase calorie count? I'm excited, I live in New Orleans and its great to see a healthier version of something my family loves! I will be adding some spice too! If you don't eat it, it shouldn't increase it much, depends on how fatty it is. I wish I could find andouille. Spicy italian will have to do. I made it tonight just as the recipe says, and it was delish! Added turkey kielbasa for my two year olds, but they actually liked the andouille also! I have been using your website since October of last year and I finally had to make a comment. I love all of your recipes, but this one takes the cake! It is so tasty, and I just finished making another batch (made the first one last week) because it was just that good. I added in some frozen okra and shrimp towards the end and it just makes the dish that much better. Thanks so much for creating this blog! I am not on a diet or anything, but I wanted to start eating more healthily and this website really makes it super easy and super tasty. I feel great when the bulk of my shopping purchases happen in the produce section! SO glad you liked it Kiera, I've been adding seafood as well, wonderful flavors! This was amazing! I read the comments before I made it and decided to add Tony Chachere's seasoning to the chicken instead of salt and pepper, which worked to great effect. I also added two diced jalapenos (that I had on hand) in with the rest of the veggies to add some additional spice as all I could find sausage-wise was turkey kielbasa. The whole thing was perfect! And I look forward to the leftovers for lunch today. Thanks for another great recipe!!! We have had this twice already, thanks to a 10# bag of chicken thighs and legs. The longer it sits, the better it tastes. Delicious meal. I know, leftovers of this dish are wonderful! If I were to make this with chicken breast instead, what would the calorie intake be? 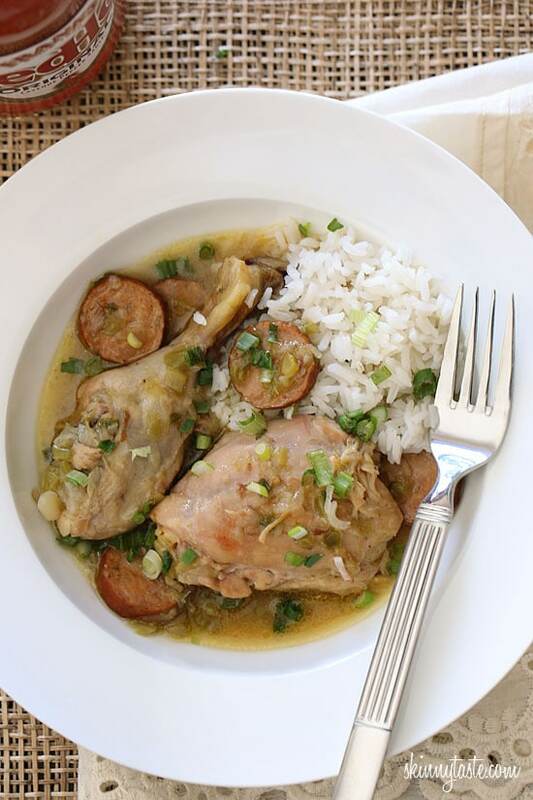 As a 100% Cajun gal- this is pretty much right on par with what my mother calls "smothered chicken" with rice & gravy but it isn't healthy at all because she uses full fat sausage and leaves the skin on the chicken! Also, do you mind if I share this recipe and your blog on Google+ ? I will also pin the recipe! Delicious! Made this last night and it was so yummy!! I absolutely Love your blog! this was absolutely AMAZING!! Made it for valentines day and it was to DIE for!! Made this tonight and its a fam fave!! One of my Top fave of your Site! I cook almost exclusively from Skinnytaste. Thank you!! Update: I used 6 chicken thighs and subbed the organic hot sausage. I'm sure the flavor was slightly different b/c of this but we still thought it was fantastic. It was a little over 400 calories a serving vs. yours. YUM! I made this again tonight but with just regular andouille again (still can't find the Applegate yet!?) We just got a Trader Joe's maybe they have it? This is SO good! Wow thank you!!! I'm currently on the Arbonne 28 Day Detox Diet, which is really strict but I feel great! This recipe works as long as you use brown rice flour. I love finding different things I can try. Thank you! Gina, I went to my organic market and they didn't have drumsticks, so I just got 2 packages of chicken thighs. Can that be substituted? 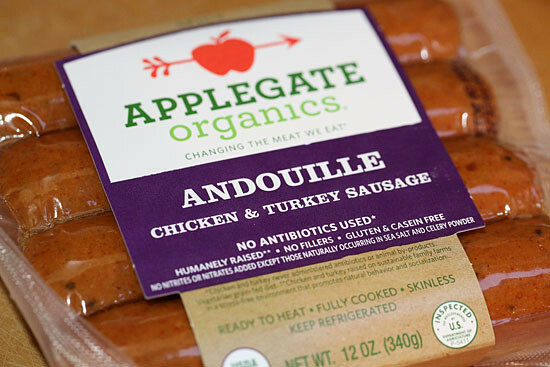 Also, they carry lots of Applegate products, but not the andouille sausage. I can either get another brand of Andouille (organic) but it's not chicken/turkey OR I can get another brand (Al Fresca, etc.) of chicken/turkey sausage. What are your thoughts about substitution. I made this dish tonight. 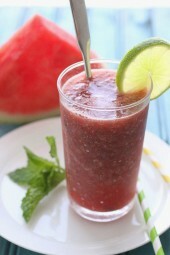 It was quite easy and delicious and looked and tasted more complicated than it was. It got thumbs up from everyone at the table. Thanks, Gina, for another great recipe! Definitely making this doubled so my bf can eat left overs through the week while im gone! As a New Orleans native, this looks awesome! 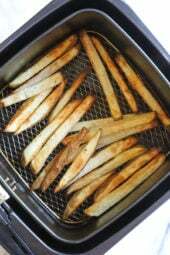 Please conitnue to post light versions of NOLA recipes! I also love your cajun pasta (i do it with shrimp vs chicken). Somh you can add spice without calories with some cayenne pepper, that's how we do it! how can I make it spicier, Gina? Cayenne pepper! Slap your Mama is a good brand. A random question – what size is that skillet? I'm in the market for a big 'un and am trying to figure out how big is too big. I love that skillet, it's actually Emeril's but I'm not sure of the size, it's pretty big. just wanna confirm if the calorie count is per serving? Looks delicious, I am drooling! Gina, your dish looks wonderful!!!! I never seen that kind of sausage! I can't wait to try this dish out! I've seen other brands carry a turkey andouille as well, use what you can find. Delicious!! I added frozen okra at the end and Cajun spice as I browned the chicken. Yum!! This was devoured by my family – including my kids (6 & 8). I thought it would be too spicy for them but they each took down two glasses of water & my oldest (8) asked for seconds on dinner (something she never does). The fact that they didn't complain about the visible green peppers & celery showed how much they loved it. Thanks for another great meal! That makes me so happy! It's really not spicy, only when you eat the sausage which is a medium heat. We really enjoyed it too. I just made this, but added some Tony Chachere's in with the water (living in New Orleans, it goes on just about everything), and I used fresh andouille sausage from my local grocer, and it was phenomenal. I'm picky about my cajun eating because I've had the best, but this was a great dish. I will definitely be making this again! I'm so glad you approved, being Latin I make chicken stew all the time, so I simply made it the same way, just swapped out the flavor profiles for Cajun ones. This looks awesome. But I think your protein total is off — I get closer to 35g/serving when I do the numbers! perhaps I made a typo, thanks I will check. 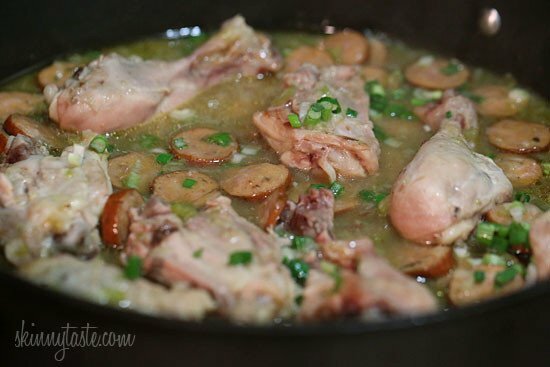 Do you take the chicken off the bone after your done cooking? I haven't used legs and thighs a lot they will cook on simmer? Only for weighing purposes, yes. I really appreciate this recipe and I'm inspired to try it. What can I use as substitute for the sausage as there is none in my neck of the world?? Use a smoked turkey kielbasa or a spicy chicken sausage. I love love love your site! 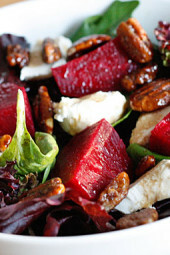 Everything looks delish — I am going to try this one, but wondered how to adapt to the crockpot? Any helpful hints? I would still saute the vegetables and chicken, add the flour then add it all to the crock pot, low 6 to 8 hours should be fine. I was just introduced to this site in January and have already made 8 dishes. EVERY recipe has been great. Steak and Cheese Sandwiches with Onions and Mushrooms are on the menu tonight! Yummmm, one of my favorites! How would it work with chicken breasts? Since they are larger, I might make 3 breasts, on the bone and cook it for a little less time. I would still serve 4 oz of chicken per person. Oh, this looks wonderful!! I loooove your site! I make several of your recipes on a regular basis, Crock Pot Sante Fe Chicken to name just one, I know the recipe by heart! EVERY recipe I have tried has been fabulous! Chicken rollatini is another favorite. Thanks for sharing your talents!! Happy Fat Tuesday everyone!! My boyfriend would LOVE this dish! Looks great. Applegate Farms rocks! I love their products. I know you said on the bone adds flavor but I have some boneless thighs to use up so this sounds perfect for tonight. Fat Tuesday kinda crept up on me! It's actually the "holy trinity": http://en.wikipedia.org/wiki/Holy_trinity_(cuisine). But no matter. Looks delicious. Not feeling well today, but that's totally what I meant. Definitely on my to-do list! I have yet to make something from your site that isn't stellar! Thanks for the recipes and keep 'em coming!